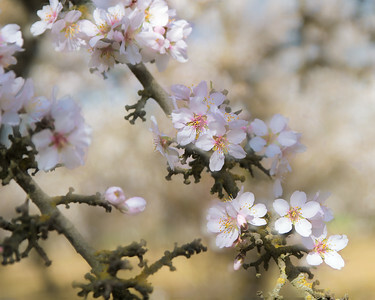 The pollination of California's almonds is the largest annual managed pollination event in the world, with close to one million hives (nearly half of all beehives in the US) being trucked in February to the almond groves. Much of the pollination is managed by pollination brokers, who contract with migratory beekeepers from at least 49 states for the event. The 'Nonpareil' tree produces large, smooth almonds and offers 60–65% edible kernel per nut. 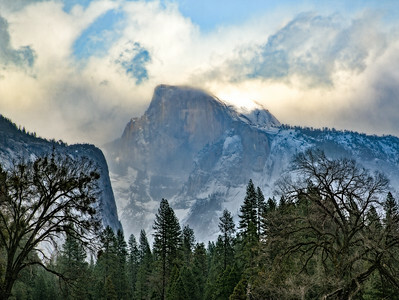 Half Dome emerges dusted with snow after a winter snowsquall. 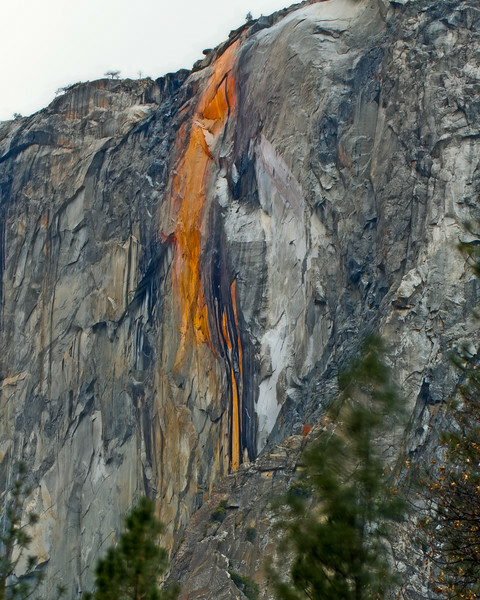 Rising nearly 5,000 feet above Yosemite Valley and 8,800 feet above sea level, Half Dome is a Yosemite icon. Named for its distinct shape, one side is a sheer face while the other three sides are smooth and round, making it appear like a dome cut in half. 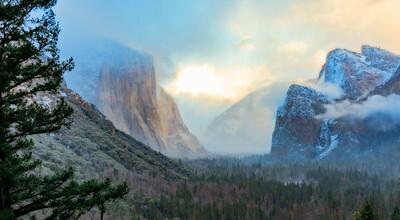 A snow squall clears out of the valley as sunset approaches on a cold February afternoon. 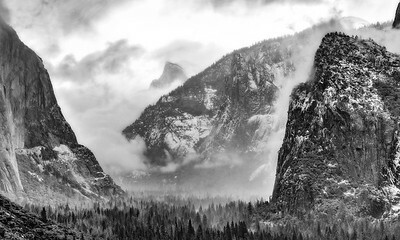 Yosemite Valley is a glacial valley in Yosemite National Park in the western Sierra Nevada mountains of Central California. 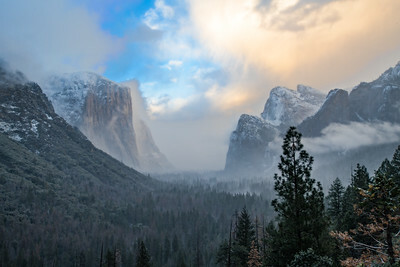 The valley is about 7.5 miles (12 km) long and approximately 3000-3500 feet deep, surrounded by high granite summits such as Half Dome and El Capitan, and densely forested with pines. 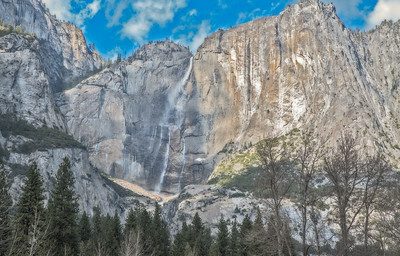 The valley is drained by the Merced River, and a multitude of streams and waterfalls flow into it, including Tenaya, Illilouette, Yosemite and Bridalveil Creeks. Yosemite Falls is the highest waterfall in North America, and is a big attraction especially in the spring when the water flow is at its peak. 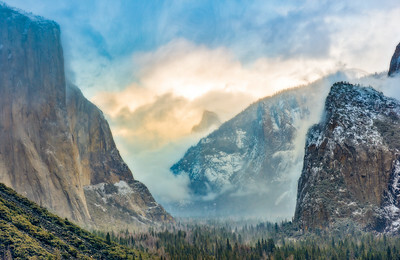 The valley is renowned for its natural environment, and is regarded as the centerpiece of Yosemite National Park, attracting visitors from around the world. 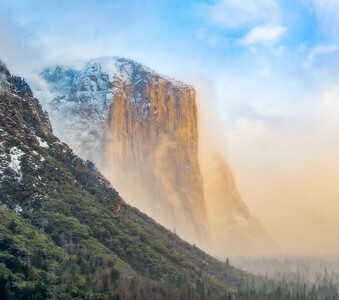 El Capitan emerges from a snowsquall at sunset. 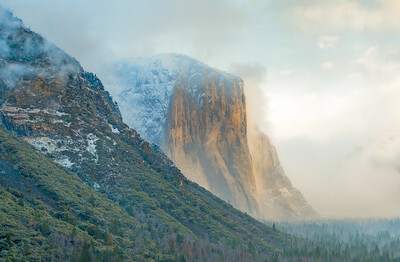 El Capitan (Spanish for The Captain, The Chief) is a vertical rock formation in Yosemite National Park, located on the north side of Yosemite Valley, near its western end. 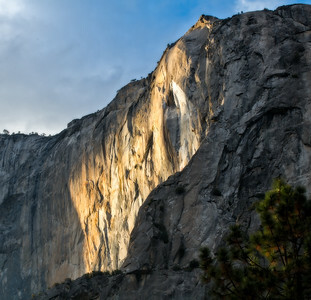 The granite monolith extends about 3,000 feet (900 m) from base to summit along its tallest face, and is a popular location for rock climbers and BASE jumpers. 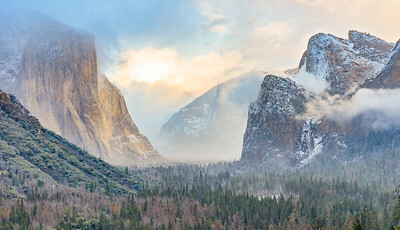 Sunset breaks through a snow squall revealing Yosemite's Cathedral Spires on a cold February afternoon. 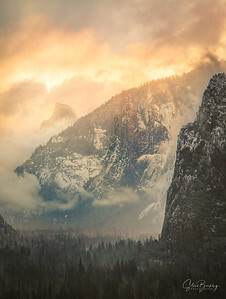 Yosemite Valley is a glacial valley in Yosemite National Park in the western Sierra Nevada mountains of Central California. 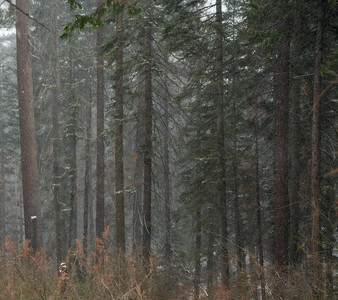 The valley is about 7.5 miles (12 km) long and approximately 3000-3500 feet deep, surrounded by high granite summits such as Half Dome and El Capitan, and densely forested with pines. 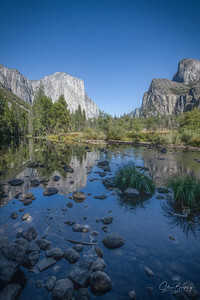 The valley is drained by the Merced River, and a multitude of streams and waterfalls flow into it, including Tenaya, Illilouette, Yosemite and Bridalveil Creeks. Yosemite Falls is the highest waterfall in North America, and is a big attraction especially in the spring when the water flow is at its peak. 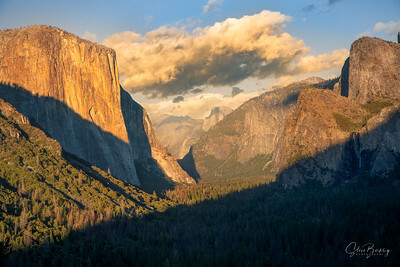 The valley is renowned for its natural environment, and is regarded as the centerpiece of Yosemite National Park, attracting visitors from around the world. 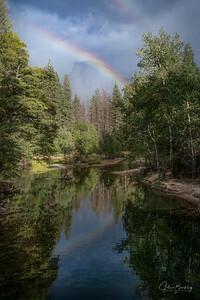 After disappearing during a sudden storm, Half Dome reappears lit with a rainbow behind the Merced River. Half Dome is a granite dome at the eastern end of Yosemite Valley in Yosemite National Park, California. 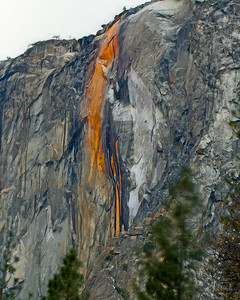 It is a well-known rock formation in the park, named for its distinct shape. One side is a sheer face while the other three sides are smooth and round, making it appear like a dome cut in half. 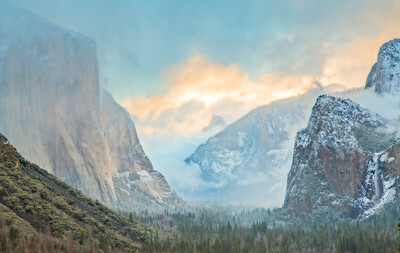 Valley View offers views of El Capitan and Bridalveil Falls in the classic juxtaposition. The lovely and serene Merced River graces the foreground between these two icons providing some beautiful texture to otherwise cold granite vistas. The view is particularly nice in fall when the grasses in the Merced River change color. 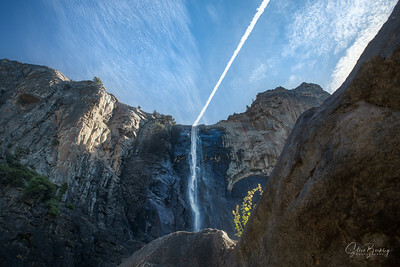 A contrail aligns with Bridalveil Falls, one of the most prominent waterfalls in Yosemite National Park, California. 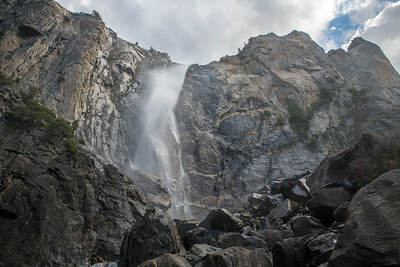 The waterfall is 617 ft in height and flows year round. In a brisk wind, the falling water is often blown sideways, and when the flow is light, it may not reach the ground directly below. Because of this, the Ahwahneechee Native Americans called this waterfall "Pohono", which means "Spirit of the Puffing Wind."